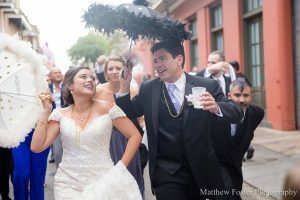 Michael and Christine Blancaneaux’s wedding was so full of tradition and fun in true New Orleands fashion. They were married in late September at the Hermann-Grima House followed by a Second Line Parade to celebrate. To top of the wonderfully sweet night, the couple enjoyed a night time carriage ride through the French Quarter. To make it even more personal, they incorporated a special Filipino tradition of the Cord, Veil, and Candle into the ceremony. Their ceremony was officiated by Rev. Steve Trahan of Sensational Ceremonies. A special thank you to Matthew Foster Photography for capturing all of the spark flying moments between this lovely couple. Congratulations to Mr. and Mrs, Blancaneaux!